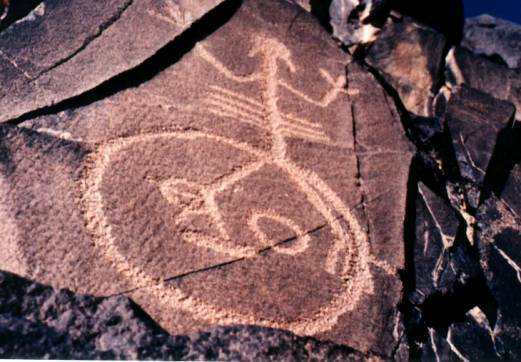 The Maodao Kulun Rock Paintings, drawn on a cliff of about 2 kilometers running along the boundary between China and Mongolian Republic, were found in Bayabnaoer City and consist of fifteen group sand more than 180 pieces with lamb, elks, hounds, scenes of hunting and designs derived from human figures depicted. Experts have made preliminary identifications and concluded that these paintings are 2000 to 3000 years away from today and are a portion of the rock painting group of Yinshan Mountains scattered along the Yinshan Mountain Ranges. Compared with the previously found rock paintings, the paintings of Maodao Kulun are marked by the following major differences. The facial features depicted bear more resemblances to those of the members of the nomadic minority nationalities of the North. Unlike the previous pictures of sun-worshipping rites where the sun is high above and humans below, the rock paintings of Maodao Kulun present pictures with sun hanging above while humans standing by its side. Some unusual and primitive symbols can be seen in these paintings, which have preliminarily been deduced as pictographs and symbols of primitive currencies. Densely depicted designs of celestial bodies like the sun, the moon and the stars can also be found in these paintings. The discovery oftherock paintings of Maodao Kulun has supplied precious materials for the study of the culture of the ancient nomadic minoritynationalities in China. The rock paintings of Yinshan Mountains consist ofmorethan fifty thousand pieces that present scenes of culture and life of the ancient nomadic minority nationalities of Chinaincluding the Hun, the Sienpi, the Turk, the Nuchen and the Mongolians. As an integral part of the rock paintings of Yinshan Mountains, the rock paintings of Maodao Kulun are the group closest to the northern frontier.